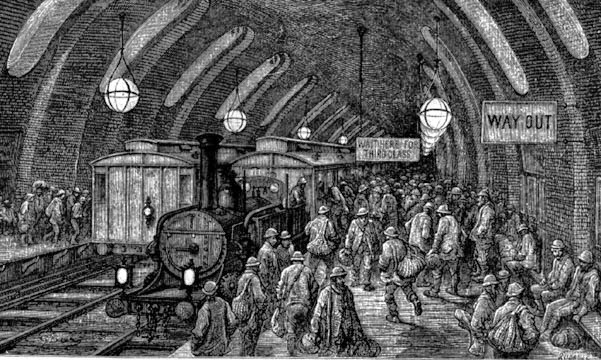 To understand the development of the London Underground, or “Tube,” one has to look at both the growth and sprawl of the metropolis and the existing modes of transport in the middle years of the nineteenth century. As the population of London expanded from one million in 1800 to more than 2,350,000 by mid-century modes of transport became increasingly mechanised and the movement of the population from the country to the city accelerated. With the expansion of the Great Metropolis, both in the number of its residents and the extension of its boundaries, many areas which had been outlying rural districts became part of the growing suburbs of the city. “There was,” as Eric Lampard opined, “a certain myopic quality to the later Victorian belief in the Suburbs.” In addition, I think that for many of the “movers and shakers” of London, their sense of the continuing progress, at least for their class, reinforced their belief in infinite progress. 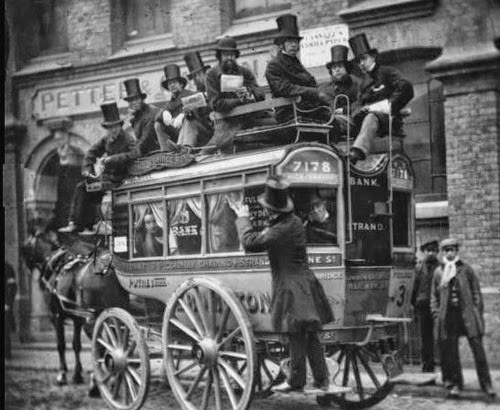 Despite their growth, their increasing affordability and being “the most characteristic feature of London, the omnibuses were not up to the task of moving the vast hordes of the labouring classes to, from and through the Great Wen. By the middle of the century, the city was reachable, at least to its outskirts, by rail-lines. 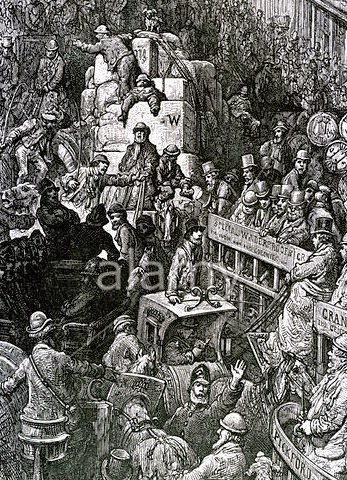 Once, however, the passengers alighted, whether at Paddington, Waterloo, Victoria or one of the other terminuses, a trip into the City itself or to the West End, became dependent on other means of transport. The traveller was thrown back on the hackney cab, the omnibus or shanks’s pony. Ironically, the growth of the suburbs with the need for increased transportation options contributed to the congestion of already overcrowded London. For example, when horse drawn trams, on steel tracks, were introduced in the 1860s, they were opposed, not surprisingly, by omnibus operators, but also by inner-London on the grounds they would increase rather than reduce traffic congestion. 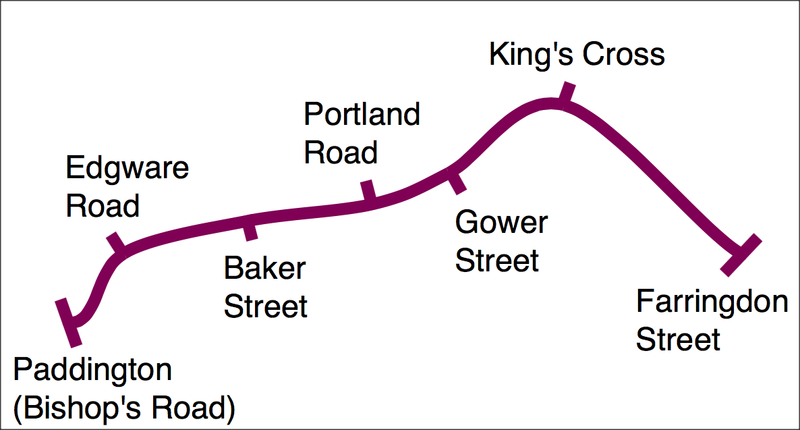 The idea of an underground system linking the termini and offering safe and speedy means of getting around London had first been mooted in the 1830s, but for a variety of reasons, including the expense of such construction, lack of interest from the established railways and the Crimean War, it was not until the mid-1850s that permission was granted for the Metropolitan Railway to begin construction of the first line at a cost of one million pounds. Construction began in 1860 and was completed three years later. The line was built using the “cut and cover” method. 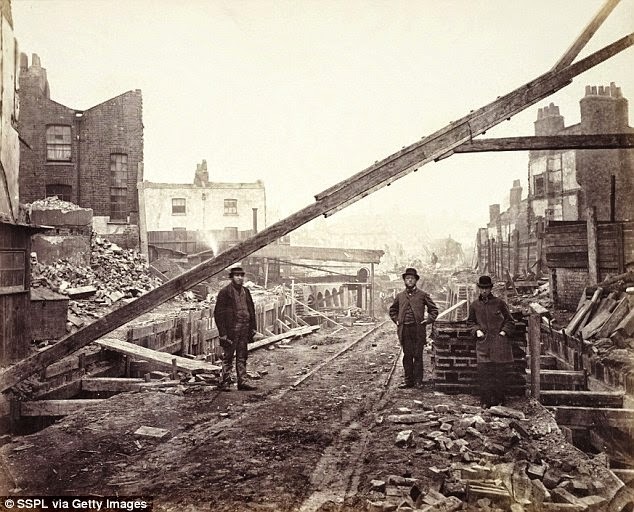 Aside from the great disruption this caused to those whose properties were demolished and the effect it had on trade in the immediate vicinity, it allowed construction close to the surface and this, in turn, helped mitigate some of the unpleasantness of travelling underground. 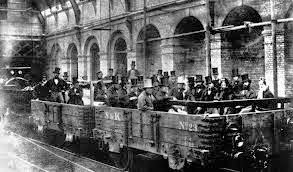 In May of 1862 the directors and engineers of the project inspected the line from Paddington to the City. Among the passengers travelling in open carts was the Chancellor of the Exchequer and future Prime Minister, William Ewart Gladstone. When the line was finally completed all of the stakeholders joined in celebration. 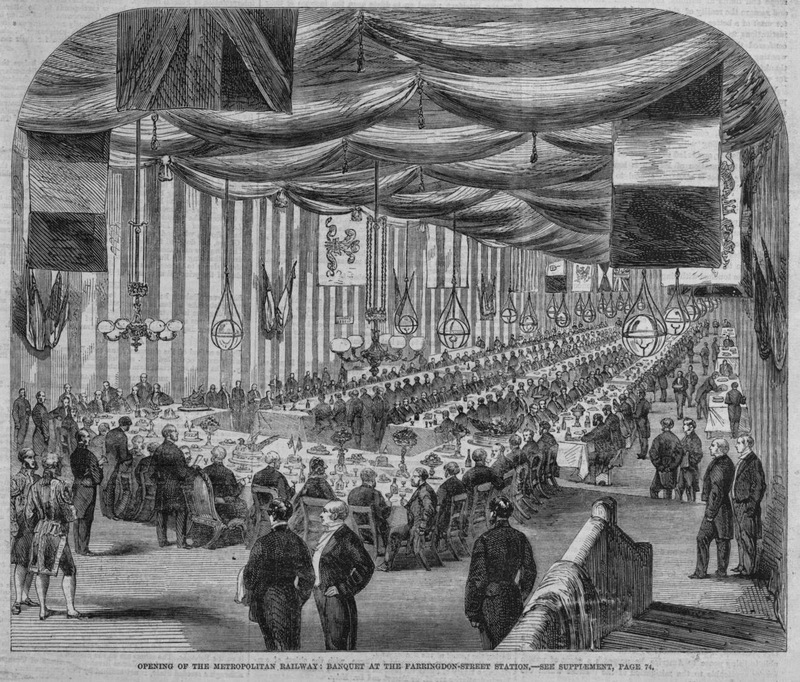 On January 9, 1863, a party of 600 Parliamentarians, railway officials and executives as well as the rich, famous and important of London progressed by train from Paddington to a banquet at the Farringdon Street Station. There were speeches made and music provided by the Metropolitan Police Band. The line officially opened the next day. Steam locomotives pulled gas-lit carriages through the dark tunnels from Paddington to the City over a distance of six kilometres. On the first day of operation the line carried 38,000 passengers and in the first week, 225,000. By the end of its first year of operation there had been more than nine million riders. Taking out a first-class ticket, we enter the large and spacious carriages, and observe at once that, different from any other railway, the carriages are lighted with gas. The line, being of the broad gauge, admits of large and handsome carriages, most comfortably and elegantly seated for five on each side, and fitted up with cozy cushions and elbows. The gas is contained in a vessel attached to the roof of each carriage, holding a sufficient quantity to last a journey. The introduction of this system of lighting enables one to read his novel or newspaper with perfect ease, and, indeed, combined with the smooth travelling on the broad gage [sic], almost makes one forget that he is in a train, and not in a drawing-room. A certain closeness of atmosphere can scarcely be avoided, but owing to the peculiar construction of the engines by which they consume their own smoke, no sulphurous fumes are added, and the travelling, if properly managed, must be perfectly safe. It has worked with success and found unexpected favour. The threats of steam and smoke, of chokedamp and sewerage, of rats and banditti, with which it has been hailed in some quarters, have been dispelled by the result. If Sir William Hardman is to be trusted, the Underground was used by the highest as well as the lowest of the land, including the Prince of Wales. The other day, just before his marriage [10 March 1863] he was smoking in a first-class railway carriage (ordinary train) and the porter, not recognising him, asked him to show his ticket. A lady residing at Windsor told a friend of ours she was sure the Prince was a person of no mind at all, as he had gone up to the bookstall and bought a copy of Punch and actually paid for it himself. Perhaps you will agree with us that an unaffected young fellow who hates nonsensical dignity, smokes in the railway, and reads Punch, may turn out not so badly after all. And while there may be much debate as to whether or not the Prince of Wales actually turned out “not so badly,” there is no question that the London Underground, the Tube, which grew out of the Metropolitan Underground Railway did turn out well indeed. Today, the London Tube carries over a billion and a quarter passengers per year over 402 kilometers of track at an average speed of thirty-three kilometers an hour.